It has been a while since Rednetic founder and Zainetica mastermind Mark Streatfield has released on his own imprint. 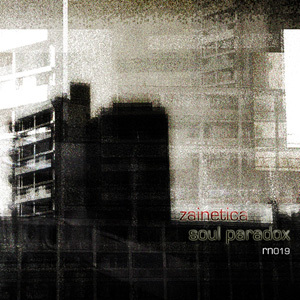 Instead, Zainetica outputs have been materialising on countless independent labels, including Lacedmilk, Enpeg Digital, Boltfish, Kahvi and many more. It was although with a Zainetica release, Streatfield’s debut, Escaping Dust, to be précised, that the label was launched in 2002. So, his latest dispatch, Soul Paradox, is a very welcome return to the Rednetic fold and another fine addition to a catalogue that is growing to be one of the most consistent around. The Zainetica sound has evolved very gently in the last six years to incorporate contemporary elements, and this latest offering is no different. While Streatfield deploys here his flawless blend of classic Detroit-infused lush electronica, shaped to accommodate warm sophisticated melodies, he adds some discreet urban undertones, especially on tracks such as A Second Life, Nomad or Soul Paradox, where Mark Streatfield assembles syncopated beats and jerky patterns into fast-moving compositions. We are far from the minimalist dance floor aesthetic of Burial or the heavy pouting of Kode9 here, yet there is something of the urban substance that characterises dubstep, amongst others, filtering down this album. This is not to say that Streatfield has jumped on the bandwagon and sold out. The eleven tracks making the album all undoubtedly bear the Zainetica stamp. Elegant electronic textures float over complex rhythmic sections, providing effective backdrops for warm melodies to take shape and develop into wonderfully tight sequences. On opener A Distance Between Us, Streatfield juxtaposes sharp electronics, warm analogue soundwaves, voluptuous synthetic strings and a processed electric guitar drone into a slow moving epic. Elsewhere, things may be simpler in appearance, but the impression of wide open space and the emotional depth are intact. Whether it is through the heavy percussions of Madness, the minimal textures of Delicate Wings or the lush and rich Lazy Nelson Days, Streatfield pulls out all the stops and create some of his most compelling work to date. Lazy Nelson Days and People More Fuel, which follows it, also hint at more noise-based experimental work, and while it is difficult to know whether these pre-empts a move toward less welcoming terrains, there is certainly here a dimension that hasn’t quite transpired in much of Streatfield’s past work. While Mark Streatfield has recently diversified his electronic outputs, first with side project Cyan341, which deals with minimal techno, and more recently, as one quarter of Lowriders Deluxe, his first Rednetic release in years is a confident slice of the finest classic electronica which will more than satisfy true amateurs of the genre.